RBTH presents a selection of views from leading Russian media on international events, featuring reports on the meeting between Russian President Vladimir Putin and Palestinian leader Mahmoud Abbas, the results of the latest round of talks on the implementation of the Minsk peace agreements in eastern Ukraine, and Russia’s decision to lift its ban on the supply of S-300 anti-aircraft missiles to Iran. 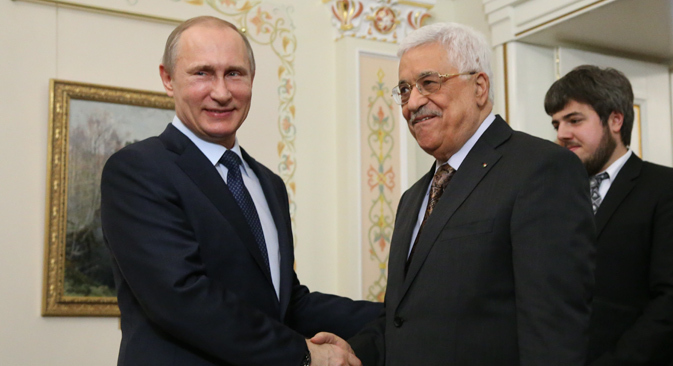 Russian President Vladimir Putin has held talks with Palestinian President Mahmoud Abbas, reports the daily business newspaper Vedomosti. Ahead of the meeting, the leaders said they would discuss bilateral relations, the Palestinian-Israeli negotiation process and the situation in the Middle East and North Africa. With regard to the warm and friendly relations between the two countries, Russia continues to support the right of Palestinians to their own state, said Boris Dolgov of the Center for Arab Studies Institute of Oriental Studies in comments to Vedomosti. According to Dolgov, financial assistance to Palestine, part of which is under Israeli blockade, could have also been discussed at the meeting. Meanwhile, President of the Middle East Institute Yevgeny Satanovsky told Vedomosti that Russia will not provide financial assistance to Palestine. As for Russian support of Palestinian initiatives in the international arena, in particular in the UN, Moscow will continue to back autonomy, said Satanovsky. The centrist newpaper Nezavisimaya Gazeta reviews the results of the meeting of the foreign ministers of Russia, Germany, France and Ukraine in Berlin on April 13. During the meeting the ministers discussed the process of implementing the Minsk peace agreements on the settlement of the conflict in the Donbass region of eastern Ukraine. German Foreign Minister Frank-Walter Steinmeier called on Moscow and Kiev to begin the next phase of the peace accord, which concerns 10 points of agreement, including control of the Ukrainian border, the restoration of relations, the special status of the self-proclaimed Lugansk and Donetsk “people's republics” and the withdrawal of troops, the newspaper reports. According to Nezavisimaya Gazeta, for this reason the talks were focused on the establishment of permanent working groups that will be involved in the preparation of local elections and issues relating to the rebuilding of the Donbass. Ahead of his trip to Berlin, Russian Foreign Minister Sergei Lavrov emphasized the unwillingness of Kiev to establish a dialogue with representatives of the Donetsk and Lugansk people's republics, writes the newspaper. According to Lavrov, Moscow is ready to listen to Kiev's suggestions regarding the deployment of peacekeepers in the Donbass, but it is meaningless to discuss them without the participation of Lugansk and Donetsk, whose views must be taken into account. Russian President Vladimir Putin has signed a decree to revoke the 2010 ban on the sale of anti-aircraft missiles (SAMs) C-300 to Iran, the business daily Kommersant reports. Russian Foreign Minister Sergei Lavrov justified the decision by referring to the progress made in the international negotiations on Iran’s nuclear program, the newspaper adds. Kommersant reminds its readers that Moscow and Tehran signed the $800 million contract for the supply of air defense systems S-300 in 2007. In 2010, following the adoption of the UN Security Council resolution banning the sale of heavy weapons to Iran, Moscow imposed tough sanctions on Tehran, and the deal was canceled. Kommersant's sources in the Kremlin and agencies involved in arms exports explain that to supply SAMs to Tehran will require the signing of a new contract, while the Iranians may be offered more advanced air defense systems. Moscow expects that in response Tehran will withdraw its $4 billion lawsuit from the arbitration court. According to PIR Center expert Andrei Baklitsky, the decision on the C-300 is not an attempt by Russia to act in defiance of the Western members of the P5+1 group [the six nations that participated in nuclear negotiations with Tehran – RBTH], but the recognition that the place and role of Iran in the region will soon change radically. "In order not to be disadvantaged, Russia should have time to remove from the agenda a major irritant in current Russian-Iranian relations," said Baklitsky in his comments to the newspaper.